Stephen King has always been willing to experiment with new ways to present his work to readers, be it serial novels, comics, illustrated prose-pieces or as in this case for a specific e-reader. This is the second story initially released as a Kindle-only piece, however whereas the subject matter of the first story UR was the Kindle itself, Mile 81 has nothing to do with the device. The title refers to a disused rest-stop on I-95 in Maine which is where the story’s protagonist, ten year old Pete Simmons, encounters a mysterious car that pulls into the abandoned rest area – apparently driverless and under its own steam – and swings open a passenger door by way of invitation to the unlucky good Samaritans that pull over to offer assistance. Comparisons with other works by King are inevitable given the subject matter, one of the characters even makes a reference to Christine, and in particular it works as a companion piece to From A Buick 8 and the ‘Low Men in Yellow Coats’ segment of Hearts In Atlantis. There are also several aspects to the narrative that will be familiar to anyone with more than a passing knowledge of King’s body of work, such as the focus on child characters – especially their ability to take weird occurrences at face value, and reference to the number nineteen which plays a prominent role in the Dark Tower series. There is also a fair amount of cultural reference, including the TV show Boardwalk Empire and the comic series American Vampire which firmly place events in the modern day, although some of the slang terms he has his child characters speak feel a little clumsy. Despite the modern references this story wouldn’t feel out of place in the company of stories from his superb 1978 collection Nightshift , it is King at his best, where he takes you by the hand and shows you the events of the story as if you were there observing for yourself. The tight word count of the short form plays to another of King’s strengths, namely characterisation. Several of the characters are only present for a page or two, but within a few paragraphs we understand them and their motivations for acting the good Samaritan. Mile 81 is not a profound piece of storytelling, it does not have much of an agenda or a moral viewpoint to espouse, it is simply an enjoyable slice of entertainment to draw the reader in and help them forget the trials of their real lives for half an hour. And with the current state of the world who wouldn’t want to escape to a place where bad things happen to other people? Mile 81 is an awesome read-in-one story that kept me on the edge of my seat. An excellent woven tale told by the master of the genre. 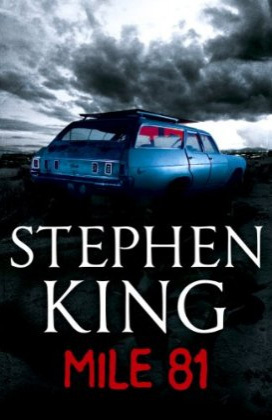 I definitely recommend it to all horror and Stephen Kings fans and any readers who enjoyed Christine, From a Buick 8. Lex Sinclair author of (Neighbourhood Watch, Killer Spiders & Nobody Goes There).